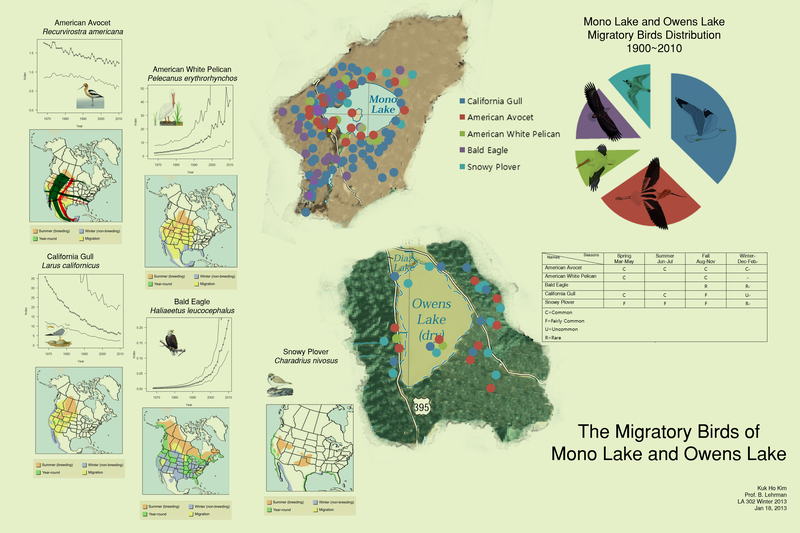 This map reveals distribution and population of the migratory birds in Mono Lake and Owen Lake. However, there are over 200 species lived in the lakes but the map is not showing all of the species because there is too many. Therefore, the five kind of birds are selected and there are several reasons for those birds have been chosen. The California Gull and American Avocet are most major population in the lakes. On the contrary, Snowy Plover and Bald Eagle are most minor population; especially, the Bald Eagle is one of the species in endangered status. Moreover, The Bald Eagles are rarely shown in Owens lake. In addition, the population of the migratory birds are slowly decreasing because of the human impact such as LA Aqueduct, but ironically, the population of birds are also increasing by human.